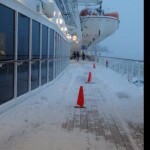 Here are some photos from people onboard the Queen Mary 2 cruise ship when it was full of snow just days ago! (January 2014). The ship is now on its way to Southampton after a delay in departure from New York. The ship is expected to still arrive at Southampton on time on January 10th. 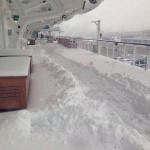 So many people online have been posting and discussing the snow onboard the British cruise ship so Cruise Hive couldn’t resist doing the same! 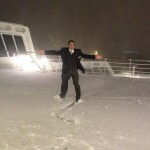 One of the photos really shows how thick the snow got and we’re sure all the passengers and crew enjoyed the rare views. The ship ended up departing New York at 1 am on 4th January. The snow came from an intense weather storm which hit west coats US. 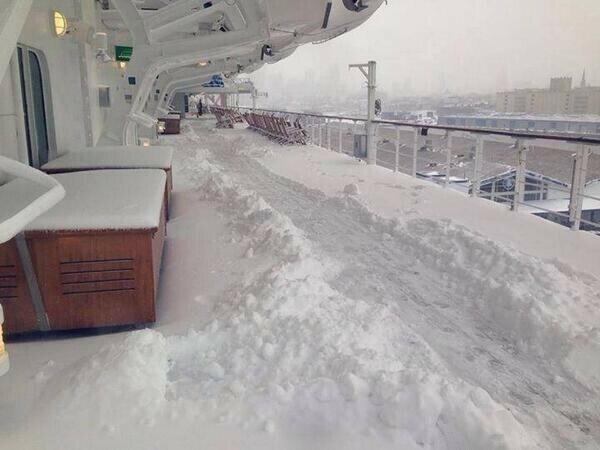 The Queen Mary 2 deck after some snow has been removed! Posted by Sandra Simpson on FB.